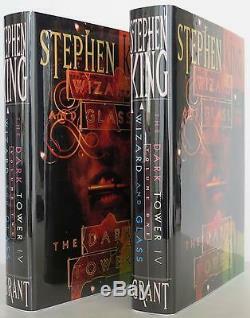 "The Dark Tower: Wizard and Glass". SIGNED LIMITED 2 VOLUME SET. Two volumes, the signed limited edition, one of 1,250 copies signed by King and the illustrator. Fine in fine dust jackets. Housed in the publisher's slipcase. The item "STEPHEN KING The Dark Tower Wizard and Glass SIGNED LIMITED ED 2 VOLUME SET" is in sale since Sunday, May 28, 2017. This item is in the category "Books\Antiquarian & Collectible".